I recently over heard someone say (quite by accident, I was stalking a particular hors de overs tray at a party and found myself standing suddenly among strangers) that the "role of a visionary is not to change the world, but to change the way the world thinks". Makes sense, really. Revolutionary ideas often pave the way for success even if they themselves end in embarrassing failure or disappointment. I repeated this in front of a client of mine a few days ago, and her response was "oh, sure. Like Jesus." I had actually been thinking more like Buckminster Fuller, or maybe whoever invented the Reeses Peanut Butter Cup, but OK, sure. Buckminster Fuller is currently, in fact, being touted as one of the "Greatest Visionary of the Twentieth Century" by the Whitney Museum here in New York. I actually know very little about Fuller, even though his work has had a relatively profound effect on my family. 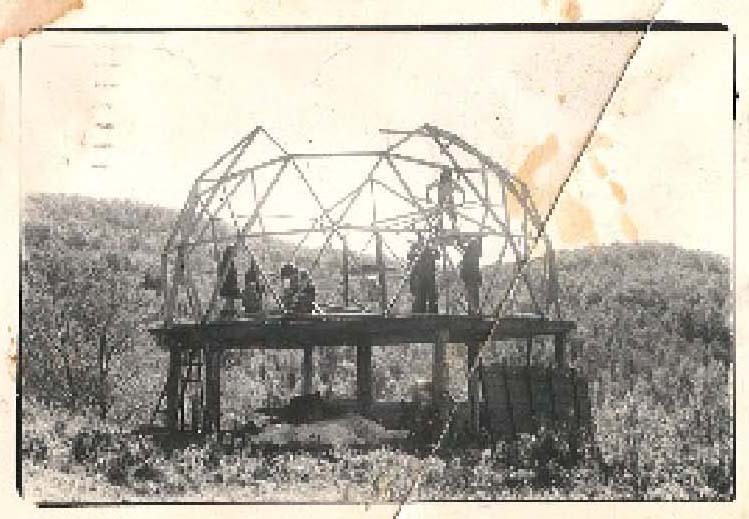 Just after my sister and I were born, my parents built a geodesic dome based on Fuller's designs and theories. It was a brave and revolutionary thing to do, especially considering the building site, which was at the top of a mountain surrounded by a thousand acres of wilderness in northern Vermont, with nothing but dairy farms and small towns for 60 miles in every direction beyond. I remember very little, but do recall very clearly the feeling of waking up inside that huge space, which was not divided by walls, and looking up into that vast kaleidoscope of a ceiling to the clear panel at the very top of the roof. I also remember spending a lot of time scampering around on its platform through the summer when it was being built, in my underpants, playing with nails. I think we only lived there for a year or so. There was eventually a small fire, I think, and then maybe a failure of part of the structure, a cold winter, a period of poverty, a Vietnam war, a lack of jobs, maybe the dome itself worked but the world around it just didn't, maybe it was the other way around, its hard to remember or know exactly. When we did abandon it, we didn't go far. The land still belonged to my family, my uncle lived at the bottom of the hill in the stone house that he had built and the old farmhouse at the end of the road filled up with our cousins every summer, with their mothers who drove shiny station wagons and their tennis racquets and their gainfully employed fathers. Among that summerhouse circle, The Dome quickly became our storied but ruined homeland. Our cousins came from Bethesda and Brooklyn, Land of Excellent Public Schools and Ballet Classes, we came from The Dome, Land of Shoeless-ness, Unplanned Kittens, and Head-Lice. It stayed with us for a very long time. I could tell by the way my cousins used the term "The Dome" that their parents had always doubted it. And while I admit feeling awkward and different because of it, I also remember something else. I remember feeling brave. For fifteen years or so after we left the dome we could still see it clearly from my uncles house, Its bare skeleton of big beams rising up among an increasingly overgrown meadow. Eventually the trees around it grew, and its beams were salvaged and used for something else. Even the cleared patch of meadow around it and the flat expanse where my mother's vegetable garden was has now been completely overtaken by a young forest of birch and maple. I hiked around up there a few years ago and found nothing left. I wasn't even sure I was in the right spot until I found, gleaming white on the forest floor and surrounded by thick moss, the big porcelain double sink that had once stood in our kitchen. Had it not been such a surreal thing to find in the middle of the woods, and had it weighed less than fifty pounds, I would have carted it back with me. Not just for the sake of nostalgia, mind you, but because it was a beautiful sink. It was the kind of sink that, if I came across it at the 25th street flea market, I would have paid a fortune for it, found a way to drag it home ten blocks, and redesigned my kitchen around it. Removing it from it's natural habitat, however, had seemed like a barbaric thing to do. Anyway, the Fuller exhibit was wonderful. TC was moved especially by the large scale models of the pre-fab homes, and the never-realized plan for floating cities that might have hovered over the earth in cloud-like spheres. 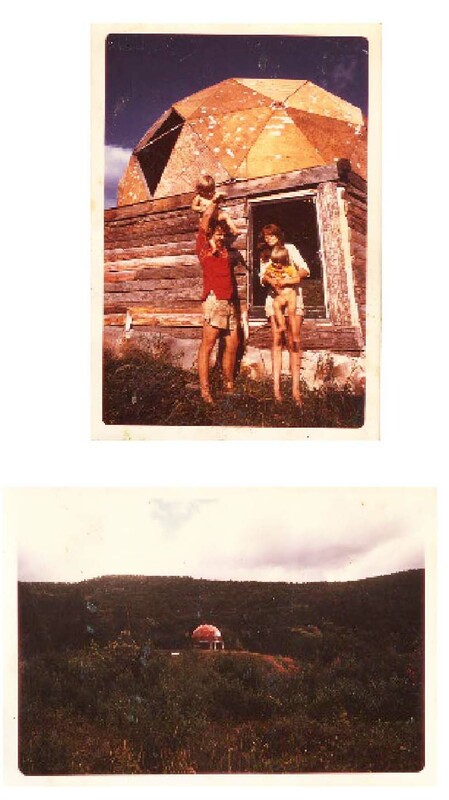 I found myself standing very near the room-sized geodesic dome that had been constructed from a cardboard kit, wondering where I might purchase such a thing, and asking myself how long it might stand in a New England field next summer before being beaten down by rain and absorbed by the ground beneath it.